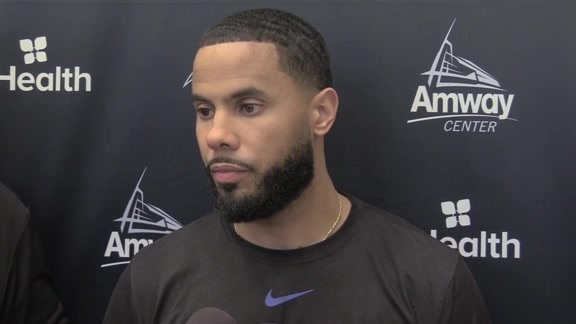 ORLANDO – Even though he was in the throes of another subpar shooting night and the final play call wasn’t originally even designed to go to him, Orlando Magic guard Evan Fournier wanted the ball in his hands late Monday night for a couple of very important reasons. First, Fournier had missed a free throw with 13 seconds remaining that could have given his Magic a lead and he badly wanted to redeem himself. Secondly, Fournier desperately craves moments like the one that Monday’s final two seconds presented, and he welcomes the pressure of being the one who ultimately decides the outcome. With 1.8 seconds remaining in a tied game, Fournier took an inbounds pass from Aaron Gordon, jab-stepped to his right to distract Cleveland forward Cedi Osman, dribbled once and calmly let fly a 24-foot jumper that was true from the time it left his fingertips. 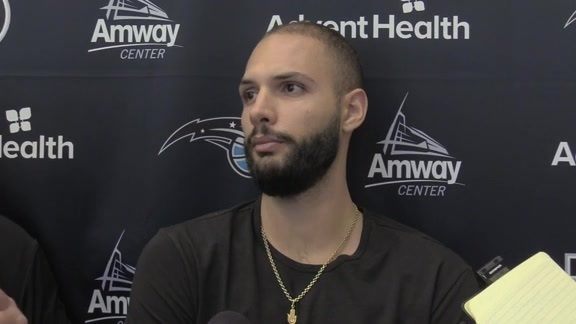 As his Magic teammates sprinted toward him to celebrate his shot and their 102-100 defeat of the Cavaliers, Fournier definitely glared ahead at an Amway Center crowd pulsating with noise. He oozed confidence out his every pore even though it was the first buzzer-beating, game-winning shot of his NBA career. The moment played out just the way Fournier wanted, he said confidently afterward, because of his comfort with the ball in his hands and games on the line. ``Those are the moments that you want to live,’’ said Fournier, who was mobbed by Magic teammates on the floor and off the bench just after drilling the straight-on shot. Fournier’s shot allowed Orlando (4-6) to win consecutive games for the first time this season and to capture a victory at the Amway Center for just the second time. Fournier’s dagger also capped a wild finish where the Magic rallied from down five in the final 41.9 seconds to crush the hopes of Cleveland (1-9). Fournier played a big role in the frenetic finish, hitting three shots and both of his 3-pointers in the fourth period and delivering a key steal with 16.6 seconds left to set up the final heroics. With Fournier’s final shot in the air, point guard D.J. Augustin raised his arms before the ball hit the net. And when it did splash down, Terrence Ross – the first option on the final play – triumphantly sprinted toward Fournier for the celebration. Fournier made just five of 15 shots and only two of nine 3-pointers, but he finished with 15 points, five assists and three steals. Gordon led the Magic with 23 points and nine rebounds – most of which came in a dazzling first quarter. Ross made three 3-pointers and scored 15 points off the bench, while center Nikola Vucevic chipped in 14 points and 10 rebounds. The Magic shot just 44.8 percent from the floor and hit 11 of 34 3-pointers, but they came through time and again late in the game to steal the victory. A night after impressively winning 117-110 in San Antonio, the Magic seemed headed for an easy sweep of their second game in as many nights. 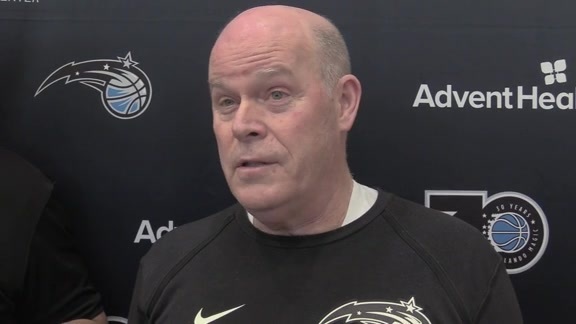 However, after going up as much as 11 points early in the second half, Orlando got outscored 30-10 by Cleveland during an extended period of the third quarter and it trailed by nine at the start of the fourth period. Fournier drilled a 3-pointer with 4:08 to play that tied the game at 88. Then, following a time out, Orlando had Fournier run off a Vucevic screen and the guard connected on a three that briefly gave it a 91-88 advantage. Cleveland veteran point guard George Hill, long a Magic-killer, made seven consecutive shots at one point in the second half and finished with 22 points and six assists. His pass to Tristan Thompson (19 points and 16 rebounds) gave Cleveland a 97-92 lead with 1:17 to play. Following a Gordon three that got the Magic back within 97-95, Ross sank down into the lane on defense, allowing J.R. Smith room for a 3-pointer that pushed the Cavs’ lead back to five with 41.9 seconds remaining. While things certainly looked bleak for the Magic, they never stopped clawing and scratching. Orlando responded with a Gordon bank shot and a D.J. Augustin steal that he turned into two free throws. The two hits from the charity stripe got the Magic to within 100-99 with 18.7 seconds left. From there, Fournier stole the ball from Kyle Korver and pushed the ball up the court where he was hacked at the rim. Fournier calmly hit his first free throw, but missed on the second, leaving the score knotted at 100 with 12.6 seconds remaining. Vucevic stuffed Hill’s layup attempt with three seconds remaining and a replay review gave the Magic the ball with 1.8 seconds remaining. From there, Fournier was able to make fans forget about the free throw miss with the game-winner that he felt was good from the time that it left his fingers. ``That’s a play that we’ve worked on and 1.8 (seconds remaining) you have enough time,’’ Fournier said. ``I knew it wasn’t going to be a catch-and-shoot (scenario) because you have to turn with your back facing the basket. So, I knew it was going to be some kind of jab or fake, but I had time to dribble. Jordan Clarkson had 14 points, while Smith added 14 points for the Cavs. Jonathon Simmons, who was in his second game back following a wrist injury, had 11 points off the bench. The Magic came into the night having played the NBA’s third-most-difficult schedule and riding high following the impressive defeat of the Spurs in San Antonio. In that game, Orlando made 50.5 percent of its shots, drilled 12 threes and handed out 29 assists – numbers that were among the best all season. Following the Magic’s defeat of Cleveland, it was Cleveland’s Smith who lobbed some lofty praise Orlando’s way. That can only happen, Fournier said, if the Magic can learn to build upon their success. Last season, following an 8-4 start, the Magic went 40 games without winning consecutively – a major factor in another sour season. This season, Orlando had failed to win consecutively in the first 2 ½ weeks. That ended on Monday night when the Magic backed up the victory in San Antonio with a defeat of Cleveland thanks to Fournier’s clutch, buzzer-beating heave.